with about 450 people in the building. because God is moving so powerfully. I'll post a blog about how it goes when the meeting is over. We have had many prophetic words about the "media coming to us"...but not sure if this was quite what we had in mind.!!! But it was an experience in itself and great to be able to serve the community in this way....where else in Bracknell would have been able to host this meeting..we have a fab building and some amazing volunteers. Lee L M looked fairly cool in his HI VIS jacket...!! David Shepherd, as a member of Kerith myself, Andrew Mackay has done alot for the community and myself behind the scenes. I have seen £900 of debut erased due to mistake the council made but it wasnt until he was involved it was settled. Too long has the "church" been hidden away and only bought out for Christmas and sometimes Easter. So I think our church is a great place to welcome the public into to talk about wider issues, And I am sure if a homeless person walked into our church anyone would do the best to help them. I think if the outcome had been different, and it had been a PR exercise for an MP, many would have agreed with you. I was certainly concerned when it became a ticket only event. Unfortunately when you make use of a local MP to get things done there can be a payback, and it was probably difficult to say no, especially when we have the largest venue in town. In reality though it was an opportunity for people to express themselves, which ultimately produced its effects. I am sure that Simon has no desire to 'attract media coverage' for its own sake, but was rather referring to a desire that God would so move that the media would have to come, rather than for politics. If you live by the Media, you tend to die by it. Kerith Community Church is actively involved in many community areas, relevant to Bracknell. A church must use the gifting it has, not try to do badly what it has no gifting for. Being involved sometimes means that you have to take risks. This was a risk, but it seems to have not reflected on the church to badly this time. Not calling the building the 'Church' in this case was probably very important. The church is the people. The media coverage has not quoted the church in relation to this and the only statement is Simon's previous post, which is clear about our lack of affiliation or allegiance. While one church member was quoted from the meeting in the papers, he was not identified as such. The media eventually just referred to it as a 'local church hall' and it went of the radar. 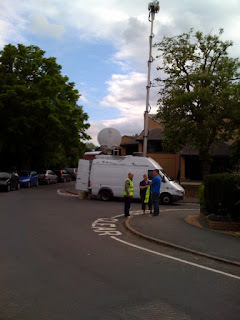 Sky's coverage was the most intrusive, with hand held amateur video from the balcony, but even they did not refer to the venue. Happily, this is my last post on the matter. I prefer honest open dialogue, but God's work should be overtaken by discord. As I mentioned, 'Of course, we could defend the use of Kerith as being 'in the world, but not of the world'. But what does it mean when an anonymous member says, 'I have seen £900 of debt erased due to mistake the council made but it wasnt until he was involved it was settled.' and another: 'Unfortunately when you make use of a local MP to get things done there can be a payback, and it was probably difficult to say no, especially when we have the largest venue in town.' This thinking needs to be challenged and rectified. Andrew MacKay is a salaried MP: it's his job. Payback vs. public service is what started the whole unsavoury expenses debacle. So, let's agree that Kerith's primary intention was public-spirited. Still, we pay our taxes and vote for exceptional high standards of parliamentary representation. We are under no obligation to bestow reciprocal favours as a repayment for his intervention. Absolutely not. Hi Simon, I wondering if you ever considered to have a worship night, I realise that this commitmentcould be too much on the worship team, but it would be good to have e,g: (Monday worship night.) no preach just worship. We did a worship evening at our monthly prayer meetings. I'm not sure who wrote this, but would love to chat this through with you if you want to come and find me on a Sunday.